Yawn. We’ve been back home from Tokyo for a while now and instead of trying to combat jet lag, I’ve been embracing it a little too much. Please tell me there isn’t anything wrong with 2:30am grilled cheese, sleeping at 6am, waking up past 3pm and basically never seeing sunlight? I’ve been taking a bunch of vitamin D because we haven’t been out during the day at all and I’m starting to feel a little like a vampire. 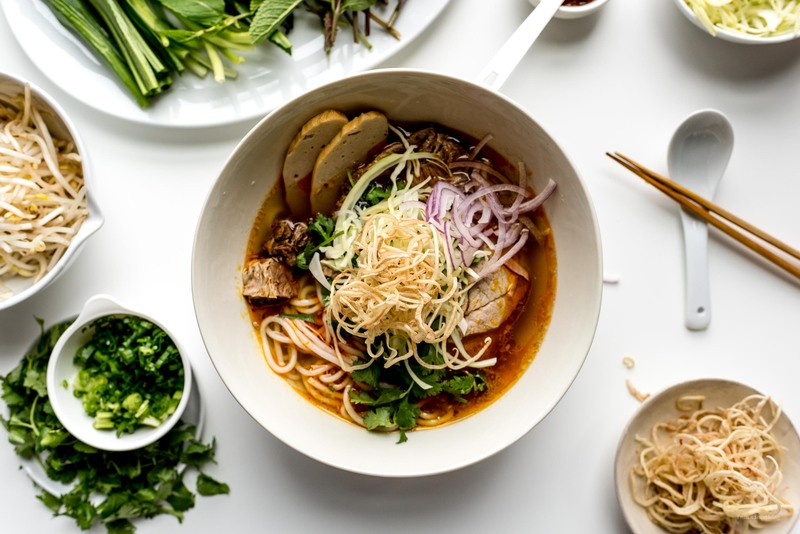 I think it might be time to get back to real life, including posting this bun bo hue recipe on this little ol’ blog. Helloooooooooooo? Is anyone still out there or is it just crickets? I wouldn’t blame you if you’ve disappeared into a hibernating state, zombie-ing out on Netflix and frozen foods. Speaking of frozen foods, our freezer froze shut! It was touch and go for a little while there, but Mike managed to open it and everything inside was still frozen, but now we might need to replace some part and I’m hoping that we’ll somehow manage to save all of the things we have in there because we still have enough stock for two bowls of bun bo hue and I think that should be what we eat next, if I get my act together and get some fresh herbs and toppings to go with. 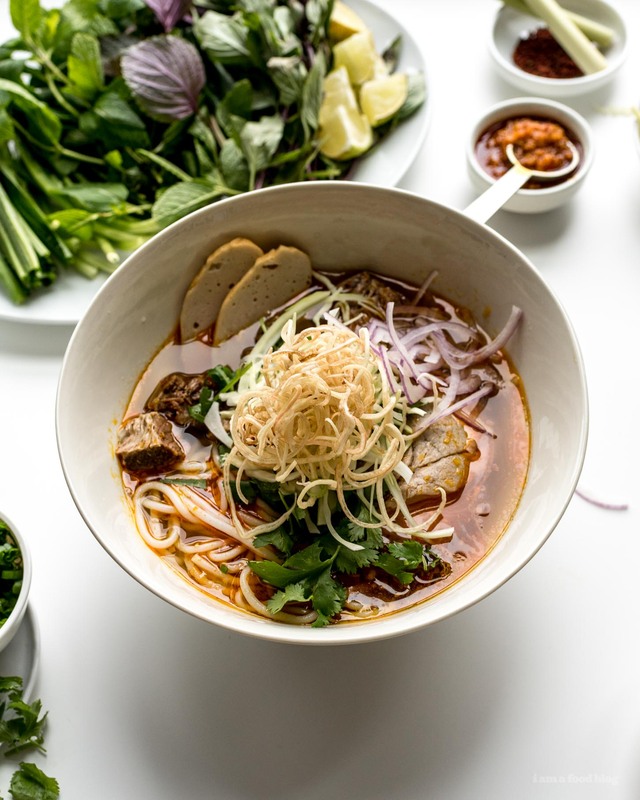 Bun bo hue is just the thing to get you through winter. It’s hearty, spicy, filled with noodles and meat, and is so, so good. 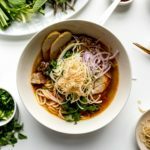 I’ve talked about it before here and here, but here we are again with another bun bo hue recipe because you can never have too much and I’m all about improving on recipes. Actually, scratch that. I’m really bad at improving on recipes. Sometimes I’ll make a recipe and it’ll be good but I’ll have ideas on what to do to improve but then it’ll just get lost in the massive list of things I want to make. I’m trying to be better about it though, especially because Mike keeps making fun of me for not doing what I say I’m going to do. So, let 2018 be the year of revisited and revised recipes because I want to strive for perfection, even if I’m never going to meet it. This bowl comes pretty close, but I still think that it could have been a bit spicier – I’m going to have to tweak that chili oil recipe. If you’ve never had bun bo hue, think of all the things you love about pho and then increase them by 10. 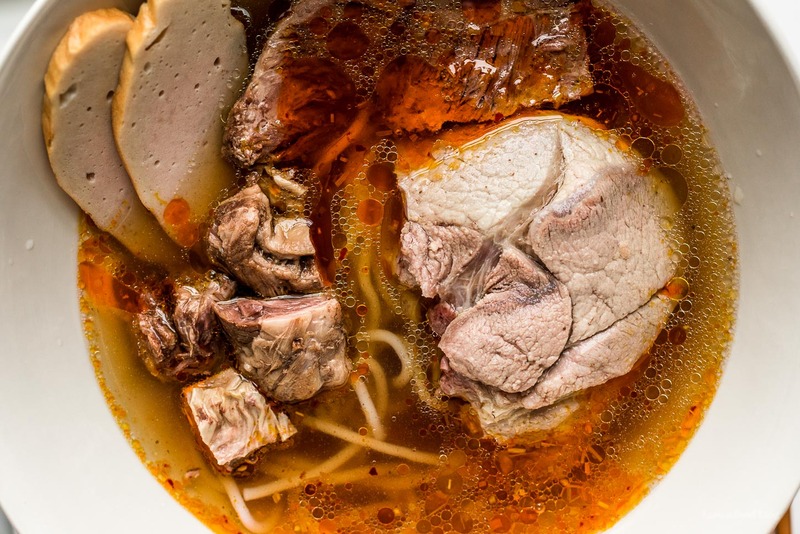 Bun bo hue, or BBH as Mike and I lovingly call it, is pho’s hotter, younger, spicier cousin. 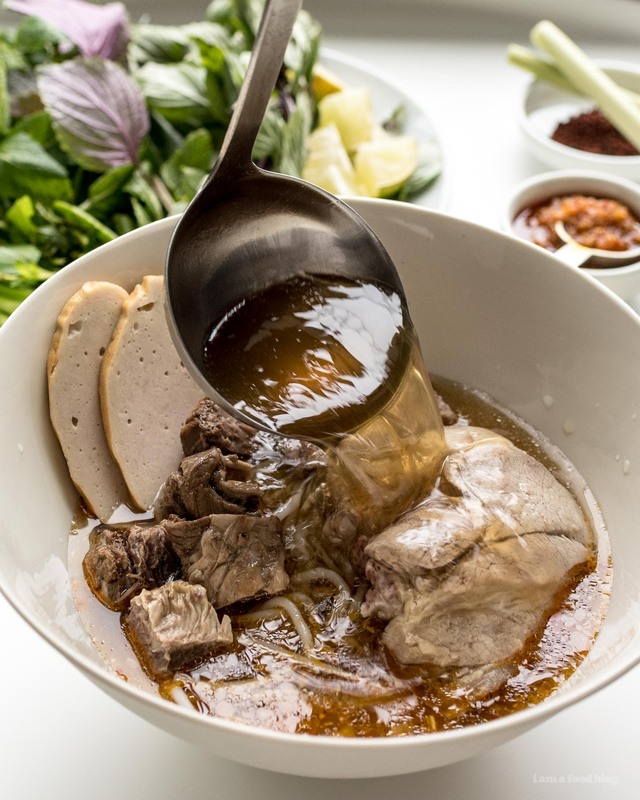 They share the same general bones: piping hot flavorful stock, slippery noodles, slices of tender beef, and fresh herbs to punch it up. 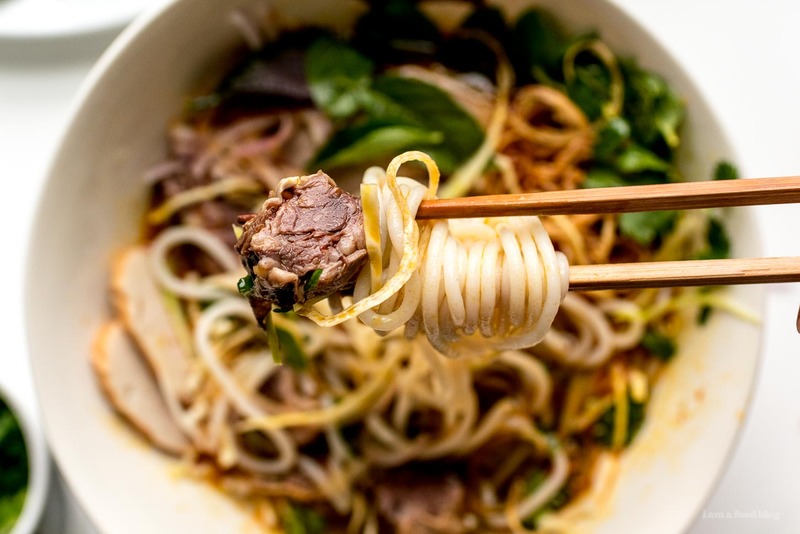 But, while pho is made with just beef, BBH is make with beef and pork, as well as lemongrass. The broth is a fiery orange-red thanks to a spicy red hot chili oil made from annato seeds, two kinds of chilis, lemongrass, shallots, and garlic. The oil is incredibly addictive, as is BBH in general. It’s spicy, savory, sour and sweet all at once – both balanced and in your face. The best part of this recipe, aside from the fact that it’s delicious, is that it was made in the InstantPot. I’m kind of sort of not so secretly in love with ours and while we were in Tokyo, I kept telling Mike all the things I wanted to make when we got home. To be honest, we haven’t made anything, so I guess I just missed the idea of it? Anyway, it makes making stock a breeze, but if you don’t have one, you can definitely make this on the stove. 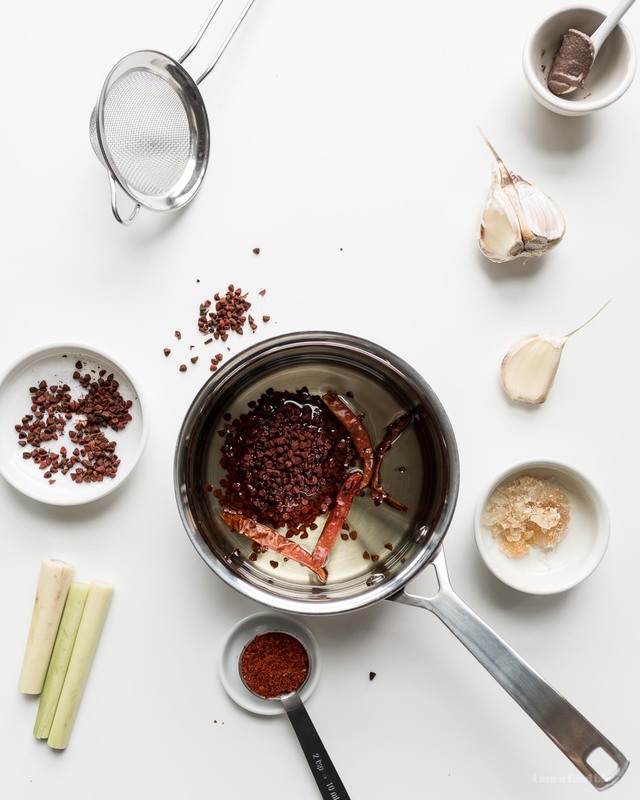 Once you have the stock and the chili oil down, you’re basically ready to assemble: cook some noodles, pop some chili oil in a pre-warmed bowl, ladle in some broth, add the noodles, toppings, herbs, and extra oil and you’re good to go. From hungry to a steaming hot bowl of noodles. For me, even better is the day after you make everything. You’ve got everything ready to go in the fridge (with the herbs even washed and everything!). You’ve basically created your own little BBH restaurant – (almost) instant spicy noodle soup, what could be better? Place the onion, shallot, and lemongrass sections on a rimmed baking sheet. Char, using a kitchen torch, until slightly blacked and fragrant. 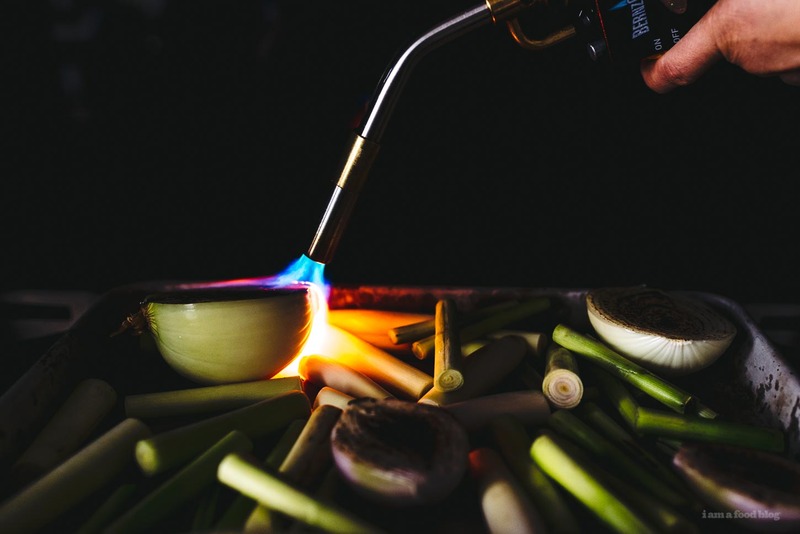 If you don’t have a kitchen torch, you can do this over a gas grill or in the stove, on broil. Place the charred aromatics, along with the meat and rock sugar in the InstantPot. Top off with water, until the max line. Set pressure to high and cook time to 35 minutes and cook. Quick release the pressure when cooking time is completed. Use a large spider or slotted spoon to scoop out the aromatics and meat and set aside. Strain the stock, with a fine mesh strainer into either a large pot (if you’re eating it right away) or a large sealable container (to put in the fridge). Season the stock with fish sauce, by the tablespoon until it is aggressively seasoned but not overly salty, about 3-4 tablespoons. Keep the stock on a low boil if eating, or cover and refrigerate overnight if eating the next day. Separate the meat from the aromatics and cut into bite size pieces. Start off by warming your noodle bowls: fill them with piping hot water from the tap, and let them sit, warming, while you’re cooking the noodles. 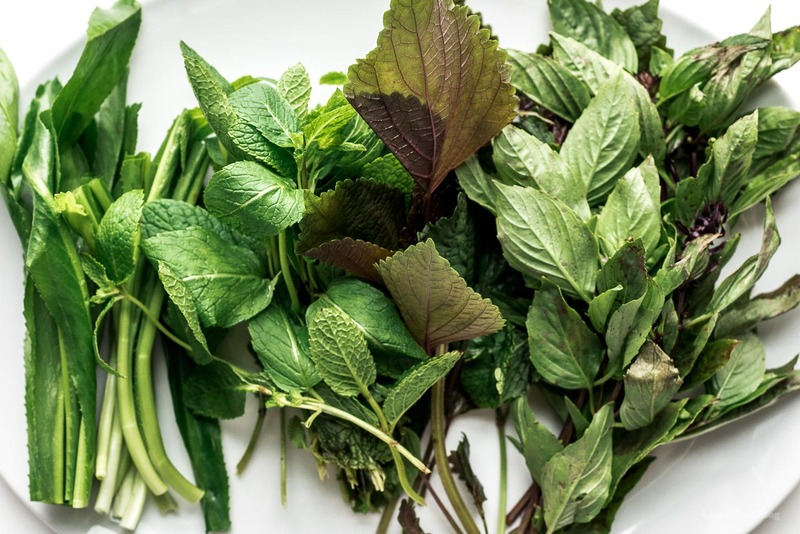 The stock should be on a low boil and all of your herbs should be washed and ready on a plate that you’ll bring to the table. Warm up the meat/keep it hot in the stock. Cook your noodles according to the package. Drain well. Pour the hot water out of the bowls and divide the noodles amongst the bowls. Add 1-2 tablespoons of chili oil to the top of the noodles. 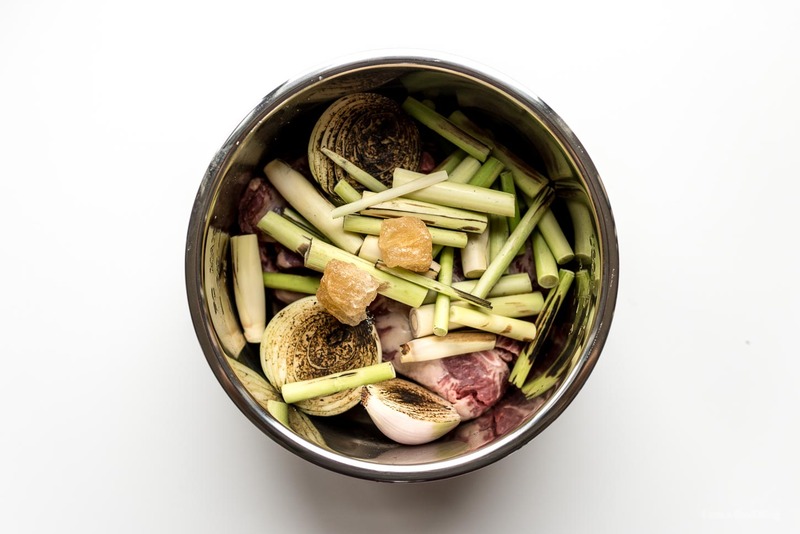 Top with a variety of meat (including sliced Vietnamese ham, if using) and then ladle on about 2 cups of the lemongrass stock to the bowl. The liquid to noodle ratio should be on the high side. Bring the bowls to the table, along with the herbs and chili oil, letting people add more chili oil as needed. Add the sliced red onions, herbs, banana blossom, and lime, to taste. Enjoy immediately. Note: If you want to make this without a pressure cooker, heat your oven to 200°F. Place the charred aromatics, along with the meat and rock sugar in a large pot and top off with 4 quarts of water. Bring the pot to a gentle simmer on the stove, over medium heat, then very carefully transfer to the oven, uncovered and keep in the oven for 2-4 hours. Continue with the above recipe. Love BBH! Can’t wait to try this recipe! Question: for the noodles, can you, please, take a picture of the package of the noodle you use for both the bun bo hue as well as pho? I have been in Asian supermarkets looking for them and the wall of options leaves me confused as to which one is the “correct” one! What would be the timing to make the broth on the stove? Also, where do i get rock sugar? My instant pot is the smaller version and I don’t think it would be able to do this. you can definitely do it in the smaller pot, you’d just have to adjust down a bit, or, if you can fit everything in, you’ll just have a concentrated soup that you can dilute with water. if you want to do it on the stove, i recommend bringing it to a very gentle simmer, then letting it go for at least 2 hours, preferably 4, then tasting from there. rock sugar can be found at asian grocery stores – if you can’t find it, you can substitute regular sugar, but will probably find that demerara has a closer flavor profile. don’t add as much though, i think rock sugar is slightly less sweet. OMG this is genius!! I loved BBH so much I ate it every week for month last year. Thanks for sharing your recipe. Btw what camera do you use for photos? The quality is outstanding, I feel like the BBH is in front of me in real life. Hi what kind of meat is the boneless beef finger rib meats? And can I use the store bought chilli oil? Or is it prefer that you make your own? they sell boneless beef rib finger meat at the butcher. they’re the pieces of meat in between ribs, without the rib bones. 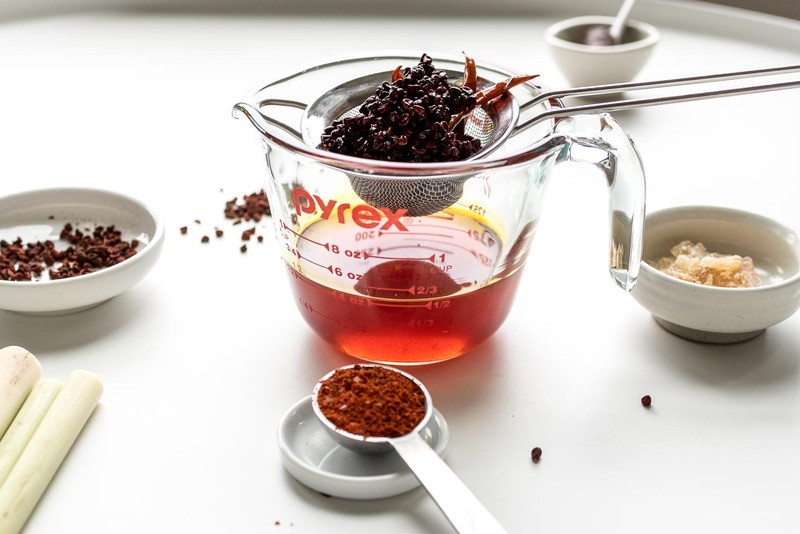 as for the chili oil, it’s best if you use the recipe included – i haven’t seen chili oil with lemongrass and shrimp paste in it at the store. Do you pour the chili oil into the stock once you are done with it?